Browhaus is a brow and lash salon which was founded in 2004 in Singapore and has invaded the Philippine market around 2008. It caters to your eyebrows and eyelashes` grooming needs. They have brow architects who were trained to professionally cut, pluck, thread and/or tweeze your eyebrows to provide you with a much more polished and precise eyebrow shape. 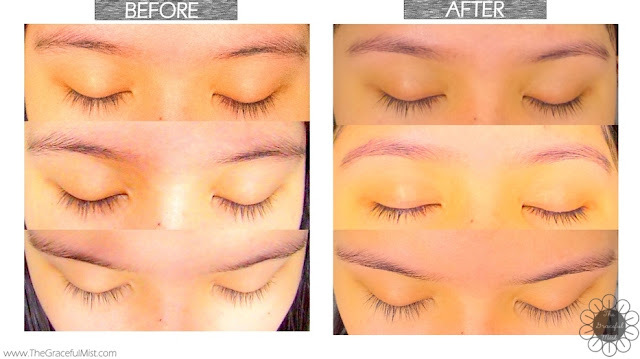 Besides brow grooming, they offer services like "Threading Complete Workout" which includes threading of the forehead, upper and lower lip, cheek, chin and sideburns and brow shaping, "Lash Services" such as Lash Removal, Lash Curl Up and Lashgraphy Color, and other services like "Eye Define" and "Lip Define". They also sell aftercare products, make-ups, and others for brows and lashes. You may visit their site to fully know more about their products and services. 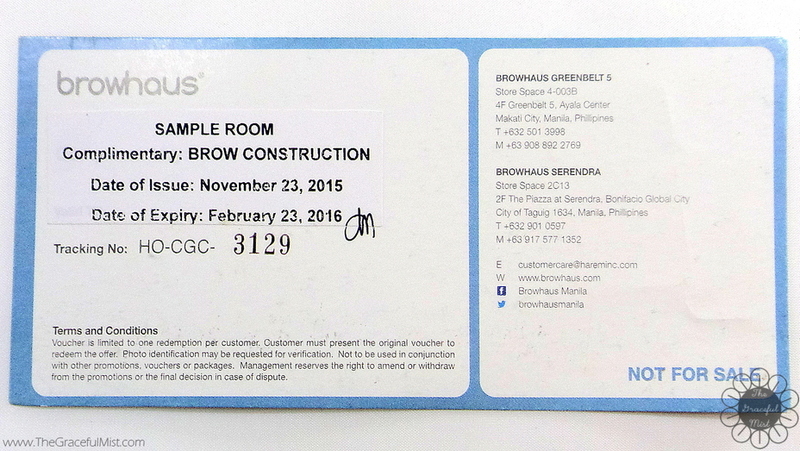 As far as I can recall, I first heard about Browhaus through Miss Kryz Uy`s brow tutorial on her sister`s channel. When I first heard about it, I thought it was such an extravagant service because I wasn`t informed that there was actually a salon specifically for brows. It seems that in this day and age, more businesses are emerging with different ideas to cater pretty much almost anything. Anyway, I saw that Sampleroom PH, a site which gives products and services up for grabs at no or minimal cost in exchange for an honest review, had a Browhaus voucher to be redeemed and experienced. Knowing that this particular service is not inexpensive, I grabbed a “sample” and only paid the shipping fee. When I arrived at one of Browhaus` branches at around 7:30 PM, I showed the woman at the front desk the Browhaus voucher from Sampleroom PH. She redirected me to the woman beside her, and I showed her the voucher too. She told me that it was for “threading” and that it would only be at 8:00 PM wherein they can take in another customer. I asked her if I can then go back at 8:00 PM and I did. When I went back, I had to wait for about 5 minutes until it was my turn to be served. While waiting, she made me fill up forms because I was a new customer. Finally my turn to be served, the brow architect asked me to lie down and told me what she`ll be doing to my brows while holding a mirror in front of my face. I had their “Classic Threading” which I`ve never experienced before. I had to close my eyes during the process but while the brow grooming is on-going, I could hear the “zzzzzssssstttt” of my brows. It actually hurt a bit. The feeling is like that of putting a scotch tape in a hairy part of your body, then pulling it off quite slowly but make the feeling of your skin a bit more sensitive since the brows` are in the face. The brow shaping process took about 15-25 minutes. Below, you can look at the photos I compiled for the “before” and “after” shots of my eyebrows. I`ve been trying to grow them out so you could actually see the difference. When the brow grooming was done, I looked at one of their mirrors and felt like there wasn`t really any difference but when I woke up the next day, that was the time I was finally able to see how they did because the hairs weren`t going on different directions and the hairs were trimmed appropriately. I liked that there weren`t any long or stray hairs. My eyebrows actually came out cleaner with a more precise shape than before. They did a good job. However, I think the price is quite high just to have my eyebrows done when there are salons out there that offer to groom eyebrows for a lesser price. All in all, the whole process of brow-grooming was not painless and the price for the brow shaping is not inexpensive but I think they did a really nice job in giving my eyebrows a more defined and clearer shape. Where do you get your eyebrows groomed? You may share your brow-grooming experiences in the comments below. Have a lovely day! I have always wanted perfectly shaped arched brows. thanks for the info. If possible I will check it out. This sounds like an awesome option for quality brow shaping. They did a great job with your eyebrows. I have never done a brow grooming, but that looks really nice how your brows were shaped! This is a great post. I get my brows waxed normally every few months and then maintain them at home. Ive been wanting to try threading but haven't found a place to do it. I've noticed how full and thick all the models/instagrammers eyebrows are looking these days... makes sense why shops like this are popping up all over. I'd love to try one! This looks good. I hardly go to the brow salon because I make my brows myself at home using a thread or a tweezers and they do come out perfect. I also don't need any tinting because my eyebrows are naturally thick and beautiful. I think I am lucky because I don't have to spend on my brows. I can totally see the difference in your comparison photos - they do a great job. I'm a bit afraid to let my brows get groomed. I love good eyebrows, they make such a difference to a face. I get mine threaded as I find the shape stays nicer for longer. I don't have any experience about this solution but it's very interesting! I usually get HD brows done, and love the results. Your brows look great after, but these treatments really can be expensive! I have never had my brows threaded before, I usually get them waxed. I think the price for hair removal is always really high but people are just paying for that extra neatness and the fact that they don't have to do it themselves! Brows have been my problem for a long time. First because they were too thicj=k and now because they are to thin - thanks for the late 90s and early 00s trend of having such thin brows. I go for hair removl every second week and she does it with sugar pasta, not completely painless but I can bear it. Looks good! I've never went anywhere to have this done but it does sound like it might be worth it. Just wish it was a little cheaper! I already commented this but it seems to have disappeared! My brows have been a problem for me ever since! First they were too thick and now they are too thin. At the moment I'm trying to grow htem but not really succeeded yet. I like those places which are just for brows and hair removing. How expensive is the service? Though I find this unnecessary, I would love to have wifey and daughter try this. Such a neat job. Brows really make a huge difference to how you look, sadly not many realize that. Honestly, I do my brow grooming myself or I tell my sister to help me out with it. The second photo shows the difference better. Really clean lines and well defined brows. I get threading too when I can. It usually takes only 5 minutes or so and not 20-25 minutes to be finished. I honestly do not know what good eyebrows look like. Anything that is not a unibrow should be okay. But seeing all these brow clinics opening shows that this is serious business. That salon seems great.They just do perfect job there actually.Would love to go there. I am all for grooming one's brows. I have mine waxed and plucked. I tried treading back in college but it's just too painful for me. The last time I had treading for my brows, the top portion got bruised Lol. Looks like it's a great experiences.. Nice brow after the salon experience! Browhaus is pretty popular and well known in Singapore, glad you get to experience this in Manila~ I just did eyebrow embroidery which save me a lot of time from drawing my brows. 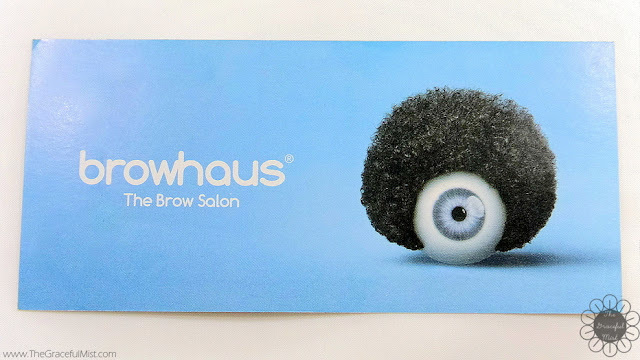 we have browhaus here in sg too! and there's a restaurant called brauhaus as well and for a while, i mixed up the two! hahaha! anyway, your brows really ended up much neater after the threading! My eyebrows isn't that shaped but I love to try like this. I have been hearing good reviews about browhaus it's just that I am too far and that the least I can do is look for other salon instead. Having a nice brow can really boost your confidence. It's nice that browhaus has good packages. Sounds like a really cool place to have your eyebrows fixed. I'm glad you're satisfied with the service! I'm sure a lot of girls will appreciate this review! I used to go to eyebrow salons but since almost last half year I do it myself... Saving quite some money & time!